But did anyone really know him? Did he even want to be known. Edward Gorey is famously infamous. His work provided the scaffolding and inspiration for Neil Gaiman’s Coraline, for Tim Burton’s creeptacular movies, for Lemony Snicket’s Series of Unfortunate Events and so much more. And yet, surprisingly little is known about him. Being nil, Gorey decided, was the safest policy. He wrote many delightfully macabre books, which alternately impressed and horrified publishers. His books could never fit into one category, which often resulted in his work being shuffled off to the side. 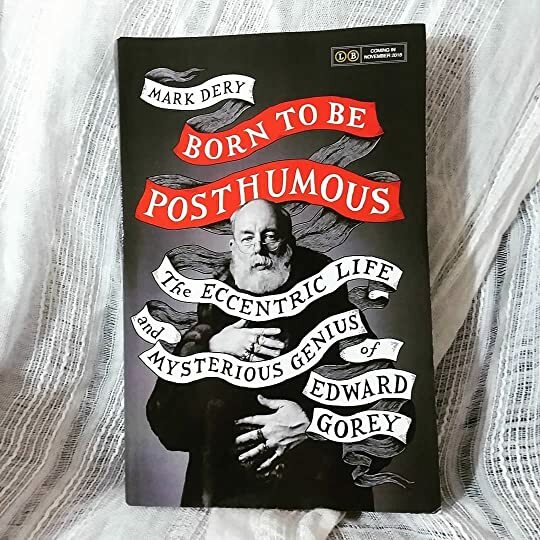 But Gorey never let that stop him – he quietly puttered around with his odd little books and while he has faded from pop culture, his immortal influence lives on. I never knew much about Gorey but I was definitely aware of Gaiman, Snicket and Burton – so I had a lot of fun getting to know the man behind the murders. I love how Gorey kept making his horrendously amoral books solely because he felt like it. I now have this huge itch to pick up everything Gorey has ever written and just read it – cover to cover – especially his murderous ABC books. The book really emphasizes Gorey’s commitment to his incredibly fine line art drawings – which have an etching-like feel – and I totally agree. I loved all of the illustrations that the author included. They were so intricate and detailed – truly amazing that those were hand-drawn. I honestly regretted that there were not more shown in this biography. Dery described the images so well that I kept wishing that he included more! I really appreciated how much time and effort the author spent researching this novel (the sources section alone took up nearly sixty pages!) but, and this is more of a personal preference, but this book felt too detailed. There were a few times where it really felt like we were circling back over and over to rehash the same topic. Gorey’s own preference, of course, was that he be seen not as a type – a gay artist or even an artist – but as an individual. Everyone who encountered him assumed he was gay, yet he maintained, to his dying day, that he was a neutral. Overall – I really enjoyed my foray into Goreyland and I am absolutely excited to pick up a few of his novels! Life, in Goreyland, is a random walk, full of mystery and melancholy, punctuated by the unpredictable and inexplicable.